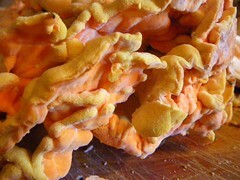 We found a fabulous Chicken of the Woods mushroom (Laetiporus), probably about 30 pounds, in pristine condition. None of it was tough and woody. I put lots of it straight into the freezer, but wanted to try to make “chicken nuggets” out of it, sort of a cross between fried mushrooms and battered chicken. I didn’t think that it would get enough cooking in the oil, so I simmered the chunks in salted water for about 30 minutes, then let them dry out on a metal rack for an hour. I’m not sure if this step was necessary, but since they came out really yummy, I’m going to keep doing it, I think. I made a batter by separating two eggs. I beat the egg whites until they were stiff but not dry, then added in the egg yolks and 1/4 cup of flour, a pinch of salt and some freshly ground pepper. I dipped each chunk of mushroom in the batter, then into vegetable oil heated to 350°F and fried them until they were golden. I kept them warm in the oven as I cooked the rest, letting them drain at the same time on some newspaper. 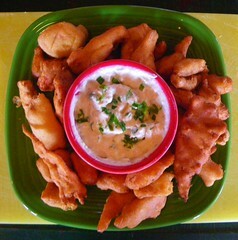 For the dipping sauce, I put a tablespoon of horseradish into a quarter cup of mayo and a quarter cup of yogurt, added about a quarter cup of green onion tops, some salt and pepper. We also tried some dipped in barbecue sauce and enjoyed it both ways.